According to the World Health Organisation, as of June 2015, 27,173 cases of Ebola Virus Disease had been reported in Guinea, Liberia, and Sierra Leone. This includes over 11,149 deaths which has left 16,600 children in these three countries without one or both parents. Forty of these children attend school at St. Peter’s the Fisherman Primary School in Tombo Village in the Western Area Rural District of Sierra Leone. Caritas Freetown, Sierra Leone, and other Caritas organisations are providing these orphans and many more vulnerable children with educational aid. Educationally, they missed school for a whole academic year. Financially, they were devastated since their families rely on fishing, small trading and farming; all of which were disrupted by the emergency situation of Ebola. Now, even though the government is allowing schools to be re-opened, many families cannot send their children back to school because they lack funds. There is no way for them to provide uniforms, bags, learning materials, and a daily lunch for their children. Yes, we must continue to pray for these children and for all the families who have been devastated. 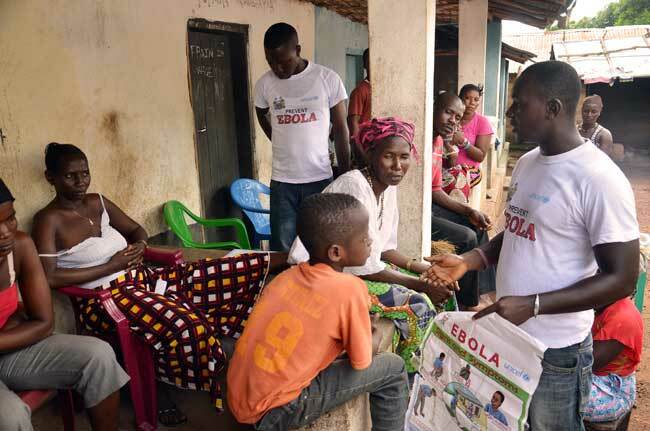 But we also must continue to develop all possible ways to emotionally, physically, and financially support our brothers and sisters affected by the Ebola Virus. On 17 June, Caritas Internationalis will join the Permanent Missions to the UN in Geneva of Sierra Leone, Liberia, and Guinea, in hosting a side event in conjunction with the 29th Session of the United Nation’s Human Rights Council. This event will focus on the needs of orphaned children whose parents have died of the Ebola Virus Disease. Fr. Peter Konteh, will be a guest speaker at the event, and will present good practices for the support of such orphans. The UN Special Rapporteur for the Right to Health, Mr. Dainius PURAS, a mental health expert himself, will discuss the special psycho-social needs of such children. Hopefully, this important discussion, will motivate governments and civil society to look beyond medical needs of those who were infected with this virus. Concerned stakeholders must take into account, as well, the broad-based needs of the children who have lost their parents to Ebola, all in the hope of creating a dynamic response to these most vulnerable children.